I suppose I should start this review with a disclaimer: I am a huge, huge fan of Demon's Crest a.k.a. Gargoyle's Quest III on the SNES, and I have been hoping against hope that the game would eventually make it on the Wii's Virtual Console so more people could discover its greatness. The temptation is therefore high to give Gargoyle's Quest on the Game Boy a raving review in the hopes that enough sales of it would prompt Capcom to make Demon's Crest available. Ultimately, however, militant reviews seldom work (reviews barely affect sales in general) and only undermine your credibility, so honesty is the best policy: Gargoyle's Quest is a good little game in its own right. Emphasis on "little". inexplicably green on the box art. In the early days of the Game Boy, the selection was mostly composed of quick arcade titles such as Alleyway or puzzle games like Dr. Mario. 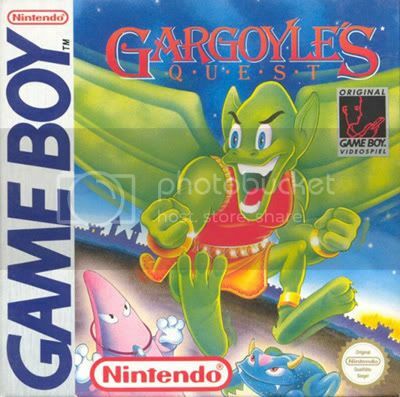 The platformers or adventure games were few and far between, and Gargoyle's Quest was an ambitious early attempt to offer a quest with a little depth to it. It combines two distinct gameplay styles: an RPG where you travel from town to town, talk to NPCs to get clues, travel to the next dungeon, and get into random encounters; and sidescrolling action stages where the platforming and combat happens. The RPG aspect of the game is very basic: there is only one item you can buy with the currency you find (extra lives), the overworld is extremely small, and there is only one clear path to follow the whole way through. Furthermore, the text is riddled with typos, only 4 words at a time are ever displayed in the dialog boxes, and the random encounters are simply irritating. But there is no doubt in my mind that the RPG gameplay adds to the charm of the game. Had the game been instead a string of sidescrolling stages one after the other, perhaps only broken up by a bunch of cutscenes... it simply wouldn't be Gargoyle's Quest. It's exactly like the "sim" gameplay of Actraiser: it would be laughable compared to actual sim games, but in that context, it is enjoyable and adds to the overall experience. More care and attention was obviously given to the sidescrolling gameplay. Firebrand starts out weak: weak attack, weak jump, little health, and a very limited hover ability. As you progress and kill bosses, however, you become more agile, tougher, and your new weapons may even have special uses other than just added firepower. There was an opportunity for the developers to make the player backtrack to past levels and find alternate paths with their new abilities, but they didn't seize it: the game is strictly linear. As ambitious as the design is for an early Game Boy title, the execution is a little flawed in the ways described above. Another concern is that short games were the norm, back in those days. Epic games such as Pokémon or Link's Awakening were still years away, and the standard at the time was Super Mario Land instead. As such, Gargoyle's Quest can easily be beaten in an evening (and you'll be able to go to bed early). To mitigate that, Capcom made the game as challenging (infuriating?) as we know classic NES games to be, but people playing it on the 3DS can avoid pointless starting over from the last town thanks to the Save State. I won't tell you how to play the game, but I'll just warn you that the game can be really short if you abuse that cheat. Multiple endings, branching paths, cleverly hidden passages, character transformations, stages that can be radically altered your second time through them, chilling music and glorious graphics... are all features that make Demon's Crest one of the best game of its platform, and are all absent from its predecessor. But Gargoyle's Quest remains an interesting experience and a fun little game in its own right. I may download this one. I have never played any games in this series, so why not start with a little appetizer. Sounds like it would be best to wait and hope for Demon's Crest. So... where is Gargoyle's Quest II? I would have never touched this game had I not come across this review. However, upon reading this review...it looks like I still won't. Thanks for the detailed review anyway! I've always wanted to try this game out even though I didn't know much about it... until now! Good review Guillaume. I'll probably download this on my 3DS in the near future! And yes please, Demon's Crest is an absolute gem in the SNES library. Luckily I have the SNES cart, but it should definitely have been on Wii VC. I'm still getting it. You can't stop me! I wasn't trying to stop anyone! You'll like one of the music tracks in the game, kinda GnGish. I bought it too, despite Guillaume's attempts to sway me. Seems pretty cool so far! Hmm, I was thinking about getting this or Fortified Zone for my next GB game... I think maybe this, the little bugger is cute. Thanks for the review! BTW I like short games. I think more people should buy this. Who knows... maybe we'll finally get Demon's Crest on the VC. This is one 3DS VC game I'm definitely buying. I always wanted to play the Gargoyle's Quest games, especially the SNES one. Here's hoping they bring out the sequels on either the 3DS VC or the Wii VC.